I recently stumbled across Mom Central, a site that describes itself as "Smart solutions for busy moms." While there I noticed that they were offering parents a free sneak peek at Word World, a new show that will be premiering on PBS Kids on September 3. (If you follow the above link to Word World, you can download your own sneak peek.) I signed up and recently received in the mail a DVD containing a 2-minute introduction to Word World as well as 2 11-minute episodes of the show. Word World is a cute and unique concept that will familiarize your child with letters and words. The main characters - pig, sheep, bear, frog, duck, and ant - are all created from the letters in their name. They are really cute! Many items in the show are created out of letters - a hay stack is formed out of the word "hay"; a barn is formed from "barn"; and even a water splash spells the word "splash." Individual letters are also predominant in the program, and each episode contains at least one instance where the characters join letters to create a word, which then becomes whatever that word is - b.o.x. joined to form a box. All of my girls loved the pilot DVD. They watched the entire DVD several times, always clamoring to watch it again each time it ended. 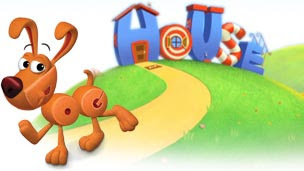 As I sit here typing this post, my oldest daughter (Pookie Bear) climbed up in my lap and named the individual letters in the dog and house pictured above. I have not worked with her on any letters except the ones in her name, and these are not all in her name. That's a great tribute to this show! For more information, read Word World's About page.